Have you stood in your home and felt confused, overwhelmed and ready to throw your hands up and walk away? Are you unsure of what is your true style? Good! Saaaay whaaaat? No seriously, that's good because you are thinking about it. Knowing there are things you like and don't like means your are on the right path. Finding your style is a journey. It doesn't happen overnight. It can take years! Let me share a secret....it took me a long time to find my style! Maybe you can relate: I grew up in a home where my mother loved traditional pieces, and moved her furniture to one spot and left it there, forever! We joke around about this still because her furniture, once placed, stays. I can remember moving my room around when the urge came along. The pieces were always in new places. This still happens today. Now my husband comes home and just stops in his tracks. He walks around saying oooh....aaah, and then says: "looks like you were busy today". I laugh! It is the same routine. I'm sure this may sound familiar to one way or the other. Are you the type that likes to keep everything the same? Change it up? Or a little of both? Knowing what you are comfortable with and sticking to it is the first battle. So, growing up in a traditional home is all I knew. When I started adulting, moved out on my own, I mimicked what I knew. Isn't that what we all do? I didn't always love it, but I found pieces that worked. Slowly as I became more confident with my big girl pants on, I would venture out and make bold moves with my choices. Perfect example, when I was in my 20's, I designed my living room around a sofa. I loved this sofa! When choosing the fabric, red with tone on tone leaf embroidery was my eye candy. I remember the design associate discouraging the choice I was making for the sofa fabric. I held strong! I recently sold that sofa. It lasted 15 years and really still looked new. No, I didn't cover it in plastic, it was used! I have three kids....there is no way I can play the 'don't sit on that' game. Slowly, I started to learn what I loved and trusted my choices. 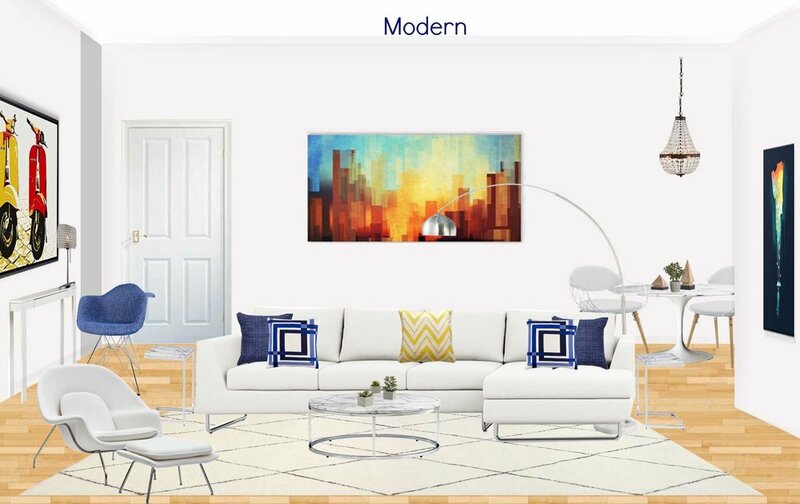 Over the years, and a lot of trial and error, I realized I like the clean lines, simple decor of modern style. With that, I also noticed I gravitated toward the warm feel of rustic decor. But most importantly, splashing these two styles with a little glam makes me do the happy dance! What does this mean you ask? This is an insane mix of ideas for a space, you're thinking right now. Well, it means I love eclectic modern rustic decor. Modern style can easily incorporate the elements of glam decor. The rustic elements warm the "cold" feeling people say modern style encompasses...for the record, I do not think it is cold! My point is, it is okay to mix styles! There are no rules! Your home is a reflection of you, if you love to mix pieces, then by all means go for it. Rock your space with the pieces that make you want to do the happy dance! Now as you begin to figure out your style, like fashion, interiors have trends. Remember, they are trends that will go out of style. Find the core pieces for your space. Decide on a style or a mix of styles to help zone in on what to buy. If you love Mid-Century lines, then start there and find a core piece that makes you happy. For instance, a sofa in this style is a core piece that can anchor your space. From there, you can continue with this style, or mix in another. Don't be afraid. Using the trending pieces to add the designed look is a great way to finish the space. These pieces will fall out of style. The best part about it, is then you can change that piece out and add a new trend. Your space will always look cohesive and stylish by making small changes. The core pieces tell your story. They let your guest know who you are and how you live. Let that be your guiding advice as you find your style. Check out some styles below and see which fits you best. It is a great starting point. I am proud to confess, I am slowly changing my home over to the true reflection of my style. I do have traditional pieces in my home still. Over time, I will add more modern style to them to balance it out. That is the key! I am looking for a balance, not an overhaul. My home is a reflection of me and my traditional roots. It is how I began my journey and it will always be apart of my style in a sense. The reality is, I find ways to incorporate and mix the styles that make me happy. It is fun, it is eclectic. I am not perfect, I am just me! July Designs from jennifer lynn interiors on Vimeo. Do you face the dilemma of finding your style? Wish you could discuss your likes, dislikes and hone in on what direction you want your space to be? Then let's chat. Book online a consultation today. I hate spam! Your info will remain private.